This isn’t a food-based “cure”, but at least it’s not out of the chemist’s pot. Nature supplies us with nearly all of what we need, and many of the "chemist’s" cures have their basis in nature. Remember that. Witch-hazel extract is sold in health stores and is commercially used in preparations for small cuts, hemorrhoid relief and as a distillate in many toiletry products like deodorants and acne remedies. Extracts of witch-hazel contain chemical components with antimicrobial and antibacterial properties so you can understand why it’s included. Witch-hazel is a genus of flowering plants in the family Hamamelidaceae, with three species in North America (H. ovalis, H. virginiana and H. vernalis), and two in Asia (H. japonica and H. mollis). Witch-hazels are not related to actual hazel (Corylus) but the leaves bear a very close resemblance to the American Hazel. 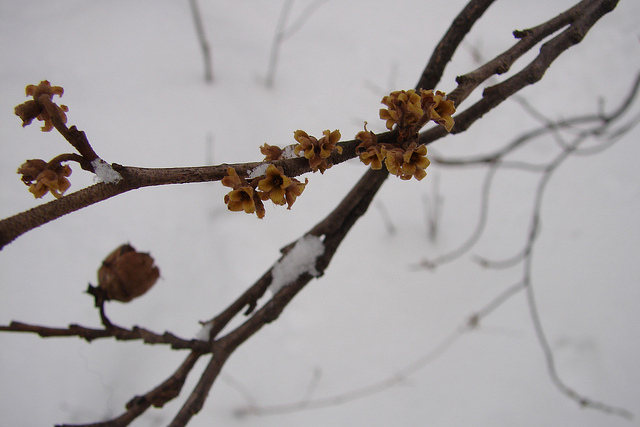 Witch-hazels are deciduous multi-stemmed shrubs or (sometimes) small trees growing between 10 to 25 feet tall. The leaves are broad with a smooth or wavy edge. “Hamamelis” mean "together with fruit" because the fruit, flowers, and next year's leaf buds all appear on the witch-hazel’s branches at the same time. Each flower has four slender petals. The fruit is a capsule containing two glossy black seeds. It is said the seeds were enjoyed by the Indians of the US south. The name Witch in witch-hazel has its origins in Middle English wiche, from the Old English wice, meaning "pliant" or "bendable." Wicker and weak are also words from the same historical source. 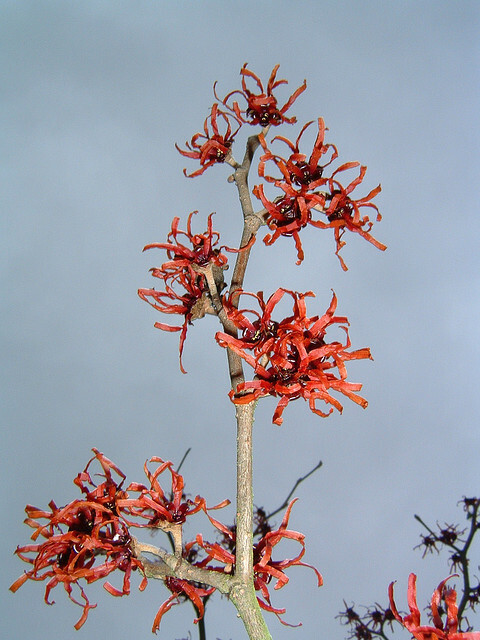 "Witch hazel" was used in England as a synonym for wych elm (bendable elm). The use of the twigs as divining rods may have, because of their magical connotations, influenced the "witch" part of the name. It's difficult to pinpoint when the spelling changed from wiche to witch. It is certain, though, that the term "witch" has its roots in Old English via the word wicca. So witch-hazel really doesn't have much to do with witches on brooms or stirring cauldrons. 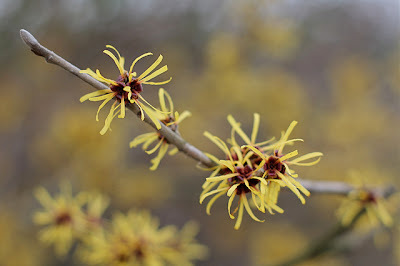 Witch-hazel has many cultivars which have expanded its desirability from nature into the garden. “Wild” witch-hazel, although an interesting tree/shrub, has kind of unassuming flowers. Through selection and breeding the size and quantity of the yellow varieties has been increased magnificently, and orange, pink and red flowering varieties are now available as well. I “relocated” a wild witch-hazel to our garden two years ago. It has bloomed both years since so it must be happy. They’re such an interesting shrub. 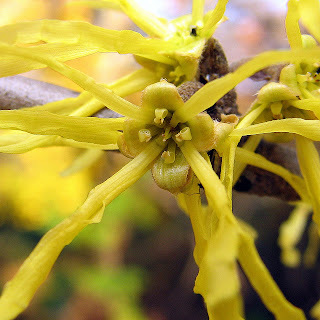 The wild yellow witch-hazel (virginiana) blooms very late in the Autumn here in Nova Scotia. Sometimes that means the leaves have already fallen. Other years they have not. This year they are in full bloom right now with many bushes still with leaves. The astringent extract from its bark and leaves is used in commercial aftershaves and lotions for treating bruises and insect bites. 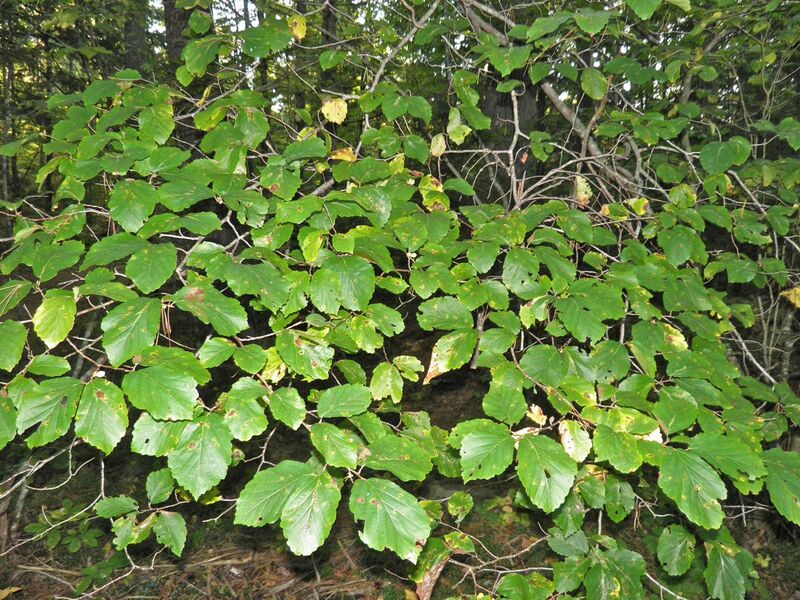 Witch-hazel helps shrink and contract blood vessels, so is used in many hemorrhoid creams. The seeds contain a quantity of oil and are edible. It is also used in treating acne. Witch Hazel is also used in treating psoriasis and eczema. In severe cases it is not as effective as hydrocortisone cream, but can be used effectively to manage mild outbreaks in most cases. Witch-hazel has been used medicinally for hundreds of years. Native Americans used the bark to treat skin ailments, sore muscles and insect bites. Witch hazel extract is still widely used today. You can make witch hazel extract at home easily at home with no special equipment. DO NOT ingest the extract. It is for external use only. One possible use I may try before Christmas is making Witch-hazel extract soap. Making soap isn't super difficult, but it does need to sure for weeks before it is able to be used. I have yet to make this extract, but I know where I can get 1 lb of twigs very easily the next time I am out of the city centre. Get out your largest cauldron...err, stock pot. Cut branch tips from the shrub. Remove any flowers and leaves. You just want the wood. Cut the pieces into a mulch with shears and place in the pot. Add just enough water to cover the mulch. Bring the pot to a boil and then reduce heat to a simmer. Let the mixture simmer for about 8 hours. Add water occasionally during simmering to barely keep the mulch covered. Remove the pot from the heat and let the contents cool to room temperature. Strain the solids out of the liquid. Pour extract into bottles or jars of choice. Seal tightly. To extend the shelf life add 1/2 cup rubbing alcohol to every 3 cups of extract. Always test on a small patch of your skin before you use any new product. Probably not, but you may be allergic. It’s very rare. Covering your body with witch-hazel extract just to discover it causes a rash would not be a pleasant experience.